Do you know why the slow cooker was invented? No, whatever I was going to write is baloney. Nor was it invented to make millions of fans of This Is Us cry with its plot line on that show (sorry, I don’t even watch This Is Us). So you could hear your kids exclaim, “Ewww. What’s that smell?” when they come home from school. So you harbor the delusion that you might eat dinner together as a family in the 5 minutes all of you are at home on a weeknight in between all of the practices, games, and rehearsals you have. So you believe you’re saving time by not making dinner one night, conveniently forgetting you spent 30 minutes making it the night before, chopping, browning and assembling ingredients LAST night so you could save time tonight. So your spouse could complain about having to clean the slow cooker when he really just leave its in the sink indefinitely, hoping the baked-on goo eventually comes off in 2-3 weeks. So you could hear well-intentioned people tell you,”I NEVER deal with baked-on goo. You really need to use slow cooker liners. They are the best! You’re an idiot.” Okay, they don’t really say “You’re an idiot” out loud, but they are thinking it. So you could spend hours searching Pinterest for just one recipe that doesn’t take 30 minutes to make BEFORE going in the slow cooker and that at least 2 of the 4 people in your family will eat without complaint. And finally? The real reason that slow cookers were invented? SO THAT NO ONE IN YOUR FAMILY IS HAPPY. What do you think? 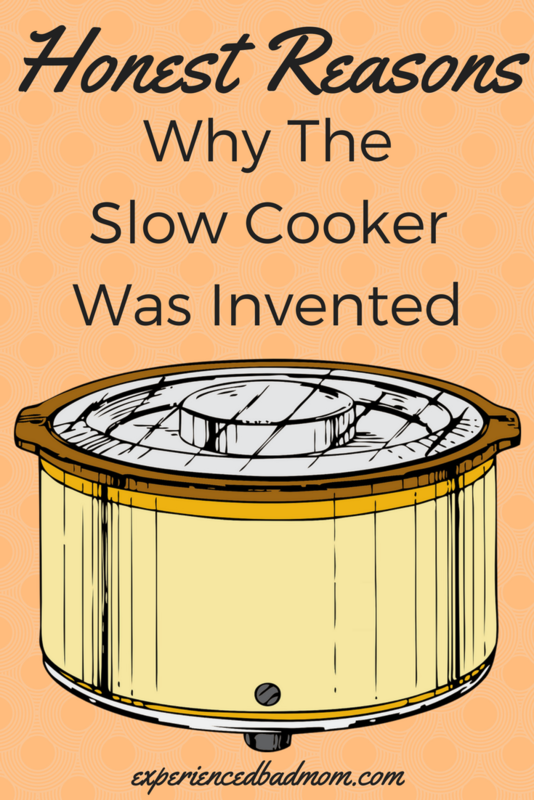 Do you know of other reasons the slow cooker was invented? Do you watch This Is Us? And, just so you don’t think I’m consumed with bitterness about the slow cooker, check out our family’s favorite recipe. It’s got tater tots, cheese, bacon and chicken. Four out of four of us recommend it! Or that craze where people spend 4 hours preparing enough meals for a whole month to put in the freezer. Who has that kind of time and that much freezer space? I’m with ya. Plus, you have to be super organized and buy everything up front before you spend the day preparing it. Yikes! Wait. Liners? There are slow cooker liners? Crikey. Who knew? I do watch This is Us but managed to not see the first couple of this season so am waiting for it to hit Netflix. Thank you for not sharing HOW he died. Even though you don’t watch it. Bless you. I simply must tell you about a gal I met at the Erma conference. She gave me a copy of her cookbook and then shared that she has 8 Crock Pots. 8. They are all often working at the same time. Yes, 8. At the same time. There was one blogger I saw that cooked with her crock pot every day for a year. That’s talent AND commitment! Did I mention she was wildly successful? Maybe it’s the gal you met. I am that one person in America who does not watch This Is Us. The slow cooker plotline is a perfect example of why I haven’t joined in. #TooManyTears ! Believe it or not, I still have the crockpot my mom bought for me when my 36-year-old son was born. Even more shocking is the fact that I actually use it! Mo recently posted…Pizza Is Nature’s Perfect Food. Add Wine, Even Better! Now that’s a good crockpot! I upgraded to one with a timer and it made a huge difference. Before, everything was overcooked and a pile of goo by dinnertime. Now, it’s edible. Plus we hit our groove and found 3-4 recipes that everyone actually likes well enough when we’ve got hockey all night and mom can’t cook. Seriously why was it invented?! Who thought it up, and also on that note, what about the instant pot?! I love my slow cooker, but you’re right. #1 is especially true! Thanks so much for sharing at the #happynowlinkup! Thank you! Secretly, I have made peace with it and we have about 4 good recipes that we cycle through during the winter. Otherwise, no one would eat on tuesdays when both kids have practice and both parents have work, LOL. I am a big fan of one pot wonders at the moment. BECAUSE WE DO NOT HAVE A DISHWASHER. I like making meals in my slow cooker but hate the mess afterwards….because I’m one of those who don’t use the liners. I’ve watched one episode of This Is Us. I keep hearing good things about the show but haven’t gotten around to really watching it yet. Maybe someday. Ha! Yes to all of them. Jenny @ Unremarkable Files recently posted…Are We Failing Our Boys? I saw the title Katy and I thought – good reminder, I’ve been meaning to get one forever. What to do??? I’m imaging all of my efforts and then the usual moans and I think I may just save myself the trouble. Thanks for sharing with #tweensteensbeyond and saving me.